I received the newly published Sports Card Magazine #114 in the mail today. 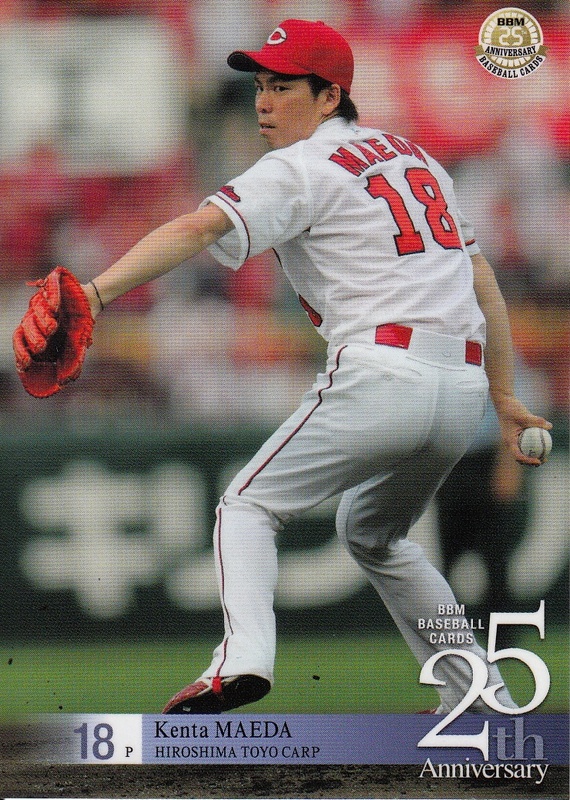 Like issue #108 that came out this time last year, the focus of this issue is the upcoming "Real Venus" set from BBM, a set dedicated to female athletes. Looking back at the list of back issues of SCM, it appears that this particular issue (the one released in late November of each year) is more often then not showcasing this set. 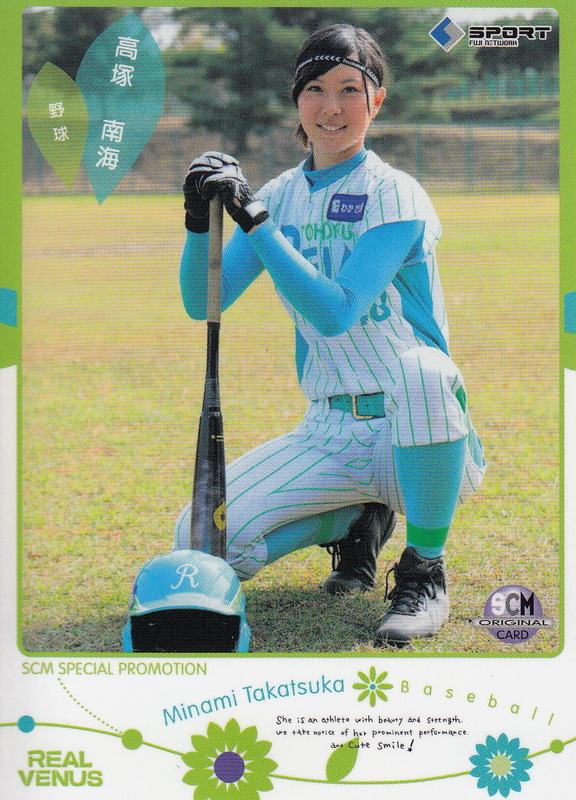 The cover story is for Rythmic Gymnast Airi Hatakeyama. 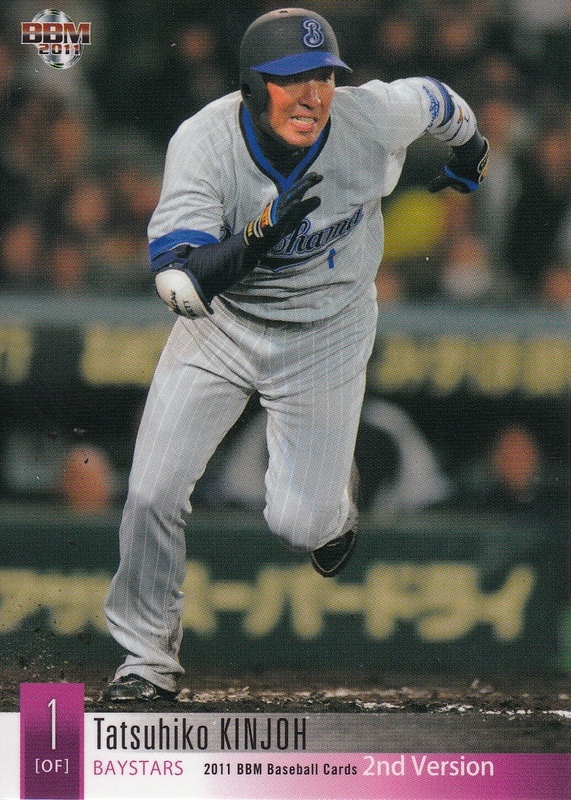 There's also about three other pages dedicated to the other athletes in the set (there are 31 in all). 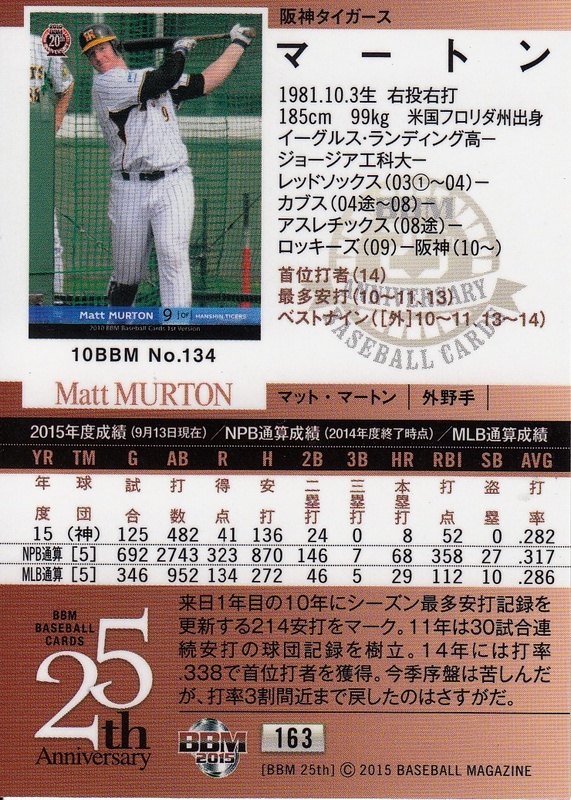 There's also a full page ad for the set in the "New Card Information" section. 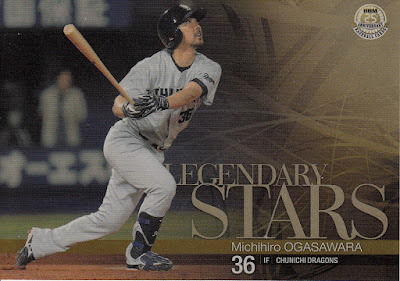 The rest of the "New Card Information"section contained half page ads for the "Swallows 3 Sluggers" and "Hiroki Kuroda Homecoming" sets, a full page ad for the upcoming "Dragons 80th Anniversary" set and a two page spread for the "Stadium Story" set. There were also full page ads for the "Legend" sumo set and the "Very Merry Xmas" female bowling set along with a two page ad for a set for Japan's Rugby league. The "newsprint" section of the magazine has a three page article associated with the "Stadium Story" set. 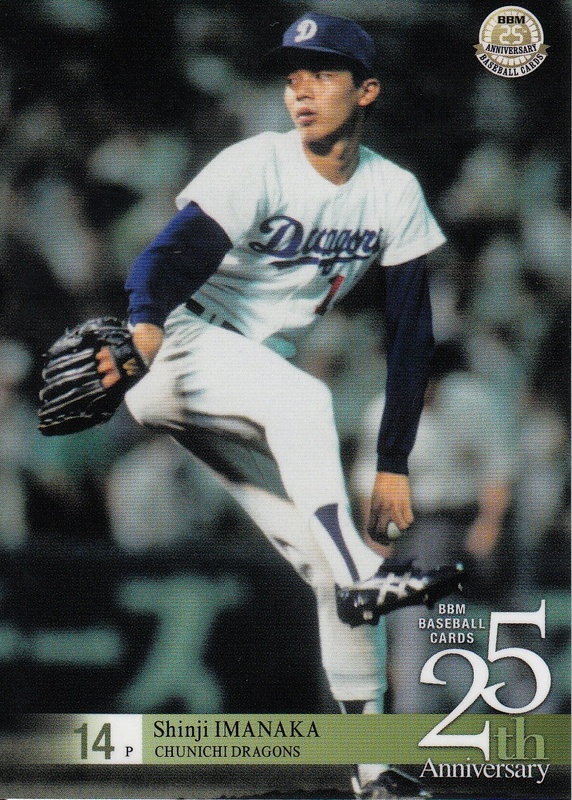 It looks like they've got a listing of events for several different old ballparks but I haven't taken the time to try to figure out which ones. There's also a two pages of some sort of box break competition between four collectors opening boxes of the "25th Anniversary" set. The "New Card List" section contains the checklists for all the sets advertised in the color section and the "old card" checklist and price guide lists wresting cards along with most 2015 card issues. 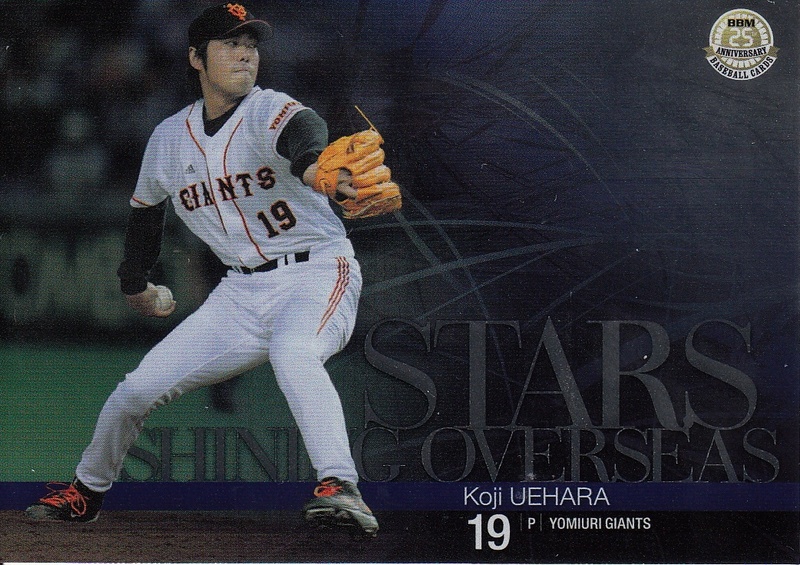 The six cards included with the issue are all promo cards for Real Venus (actually I don't know for sure if they are promos of cards in the set or alternate versions). 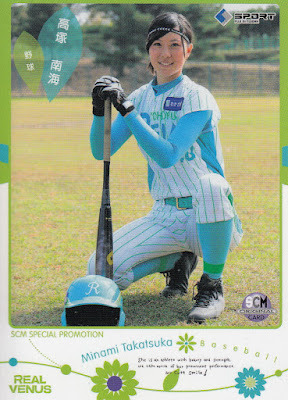 One of the cards is of Minami Takatsuka, an outfielder for Tohoku Reia of the Japan Woman's Baseball League (JWBL). The last of the major 2015 awards were announced last week. As I think most people expected, Yuki Yanagita of the Hawks and Tetsuto Yamada of the Swallows were named MVP of the Pacific and Central Leagues respectively. 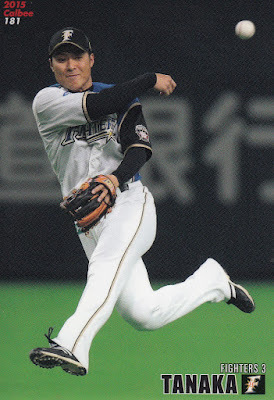 The Rookie Of The Year awards went to Kohei Arihara of the Fighters and Yasuaki Yamasaki of the Baystars. 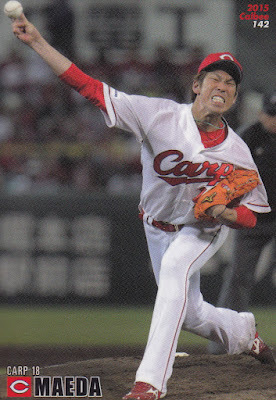 NOTE - Calbee did not do a regular cad of Ikuhiro Kiyota this year. His only card was in the Exciting Scene subset for Series Three. 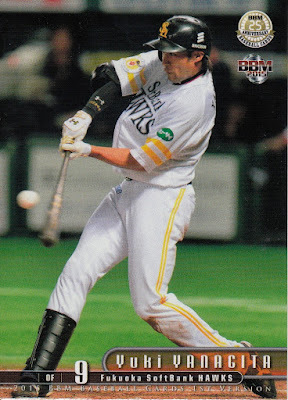 Back at the beginning of March, I made note of the fact that with Norihiro Nakamura retiring, Michihiro Ogasawara was now the active home run leader in NPB. 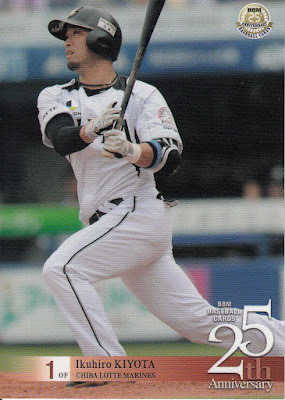 I mentioned in the post that it would not be out of the question for Shinnosuke Abe (who had 346 home runs to Ogasawara's 378) to be the active leader by the end of 2015. Well, here it is, the end of 2015 and Abe is now the active home run leader. 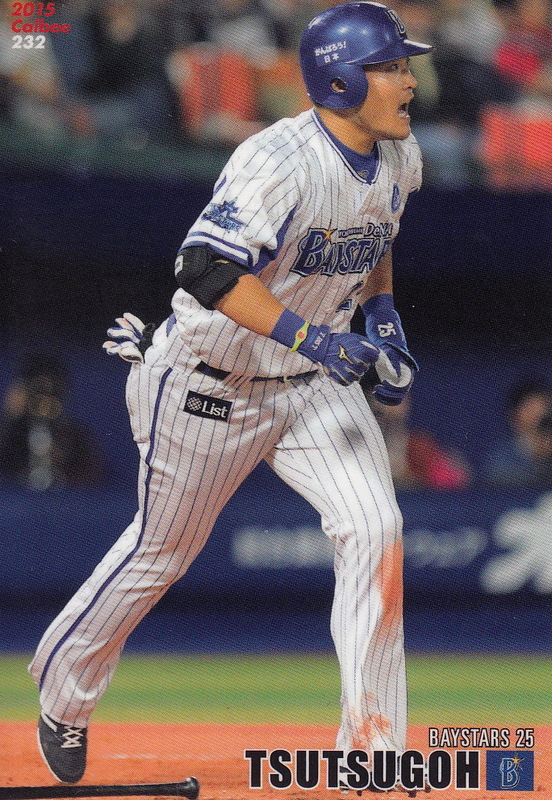 Not because he caught up with Ogasawara (he only had 15 home runs this season although Ogasawara didn't hit any) but because Ogasawara retired. Abe did pass the second place player on the list (Nobuhiko Matsunaka who also had no home runs this year). 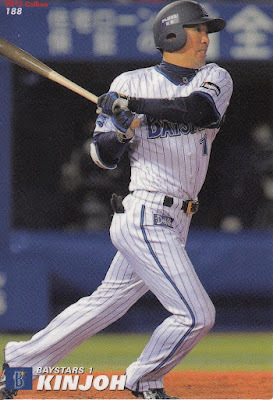 BBM released a set commemorating their 25th Anniversary at the end of October. This set has 189 cards in its base set - 180 player cards and 9 "Great Records & Highlights" cards. 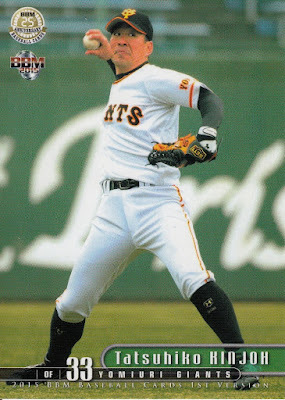 This is one of the few BBM sets that do not have the player cards split evenly between all 12 teams. 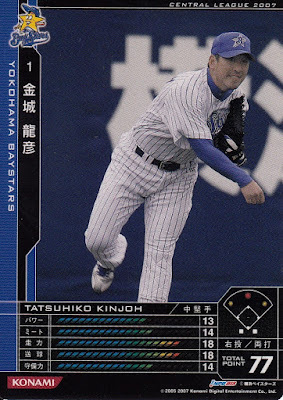 I don't think the players are split evenly between active and OB players either although I didn't actually count to see. 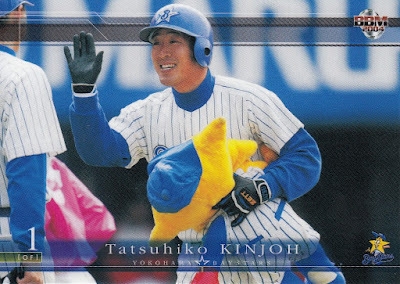 The set contains pretty much everyone who was a major NPB player since 1991. 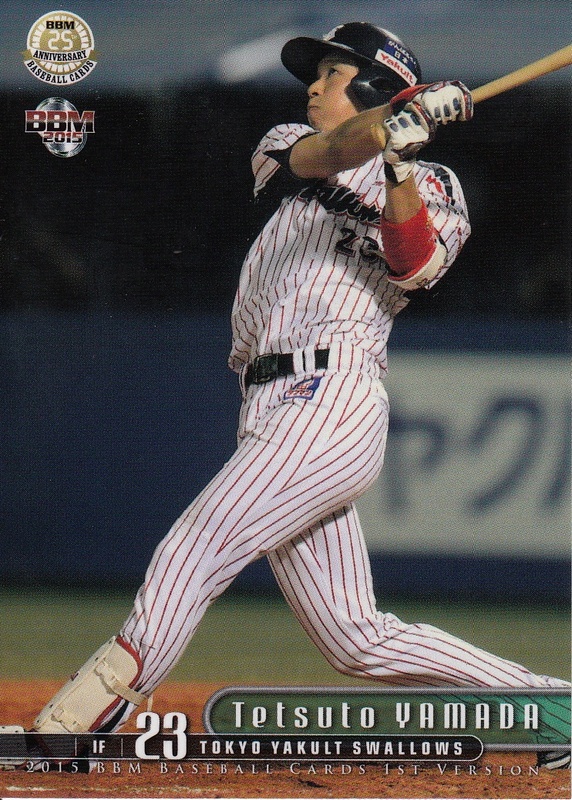 The OB players include players whose career began before 1991 but who still played the majority of their career during the BBM era - Norihiro Komada, Kimiyasu Kudoh, Atsuya Furuta, Masumi Kuwata, Koji Akiyama, Tsutomu Itoh, Yukio Tanaka, Kazuhiro Sasaki, etc. 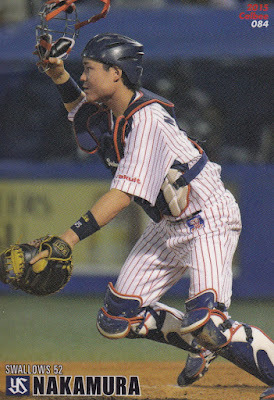 There are also (obviously) OB players who played their entire career since 1991 - Hideki Matsui, Tsuyoshi Shinjyo, Norihiro Nakamura, Kazuhisa Ishii, Hiroki Kokubo, etc. 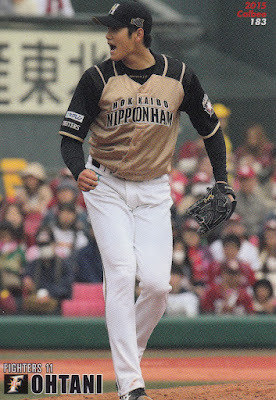 The active players include pretty much all the big stars like Shohei Ohtani, Tetsuto Yamada, Yuki Yanagita, Shogo Akiyama, Shitaro Fujinami, Takeya Nakamura and Kenta Maeda. There are a number of OB and active Westerners included like Tuffy Rhodes, Alex Ramirez, Wladimir Balentien and Matt Murton. There are also several former NPB players who played in MLB in 2015 - Hisashi Iwakuma, Masahiro Tanaka, Yu Darvish (well, he was on the DL for an MLB team all season), Norichika Aoki, Munenori Kawasaki and Koji Uehara. 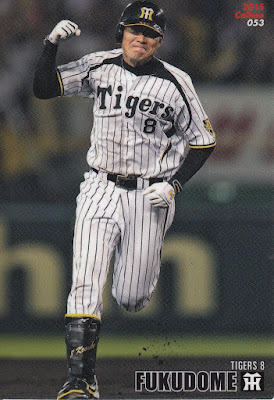 So who's not in the set? You could nit-pick the inclusion of a number of players who aren't in the set but I think the big ones that are missing are Hideo Nomo, Ichiro Suzuki, Hiromitsu Ochiai and Kazuhiro Kiyohara. 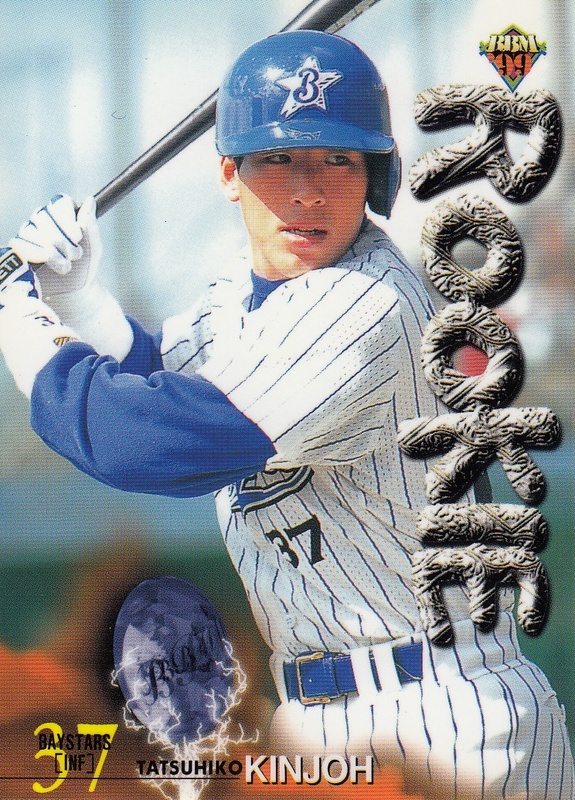 Honestly Kiyohara is the only surprise here. Nomo hasn't appeared on a BBM card since 1994 (his 2000 20th Century Best 9 cards didn't show his picture). 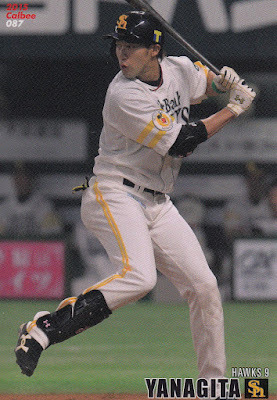 Ichiro has only appeared in three BBM sets since he left for the US and the most recent of those was 2009. Ochiai has not appeared in any baseball cards since he was fired as Dragons manager in 2011. But Kiyohara shows up in BBM's historic sets pretty regularly. 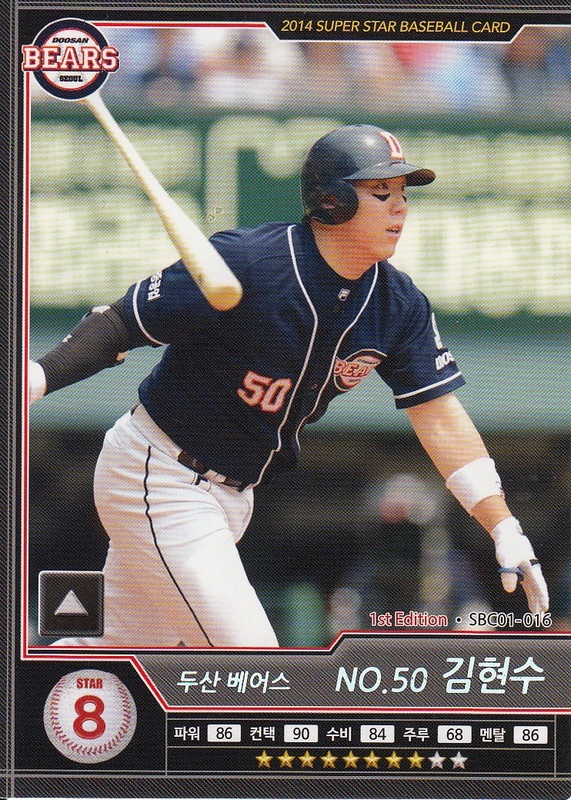 The cards themselves are fairly attractive, although I have my usual complaints about the photo selection - mostly batters batting and pitchers pitching. Some of the older photos are a bit grainy which is a complaint I had with the All Star Memories sets of the past couple years. 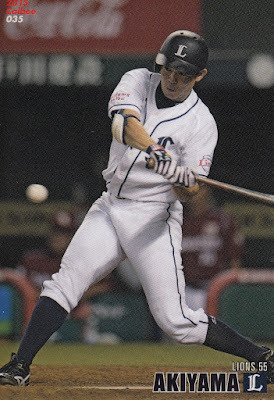 But on the whole it's a nice looking set. 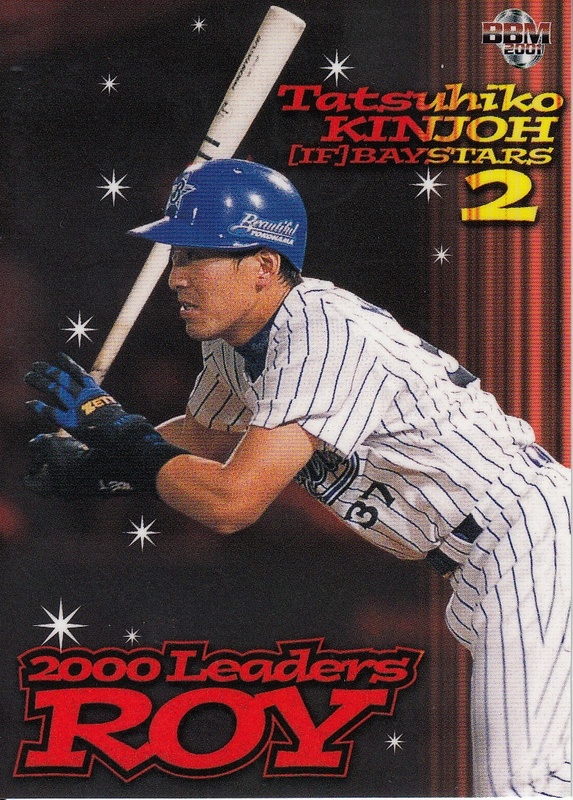 The backs of the cards feature a reproduction of the player's first BBM card, similar to what BBM did for their 20th Anniversary set back in 2010. I didn't do a full study but it looks like there's at least one card represented from each flagship set from 1991 to 2001 and each 1st Version set from 2002 to 2015 (Yasuaki Yamasaki). 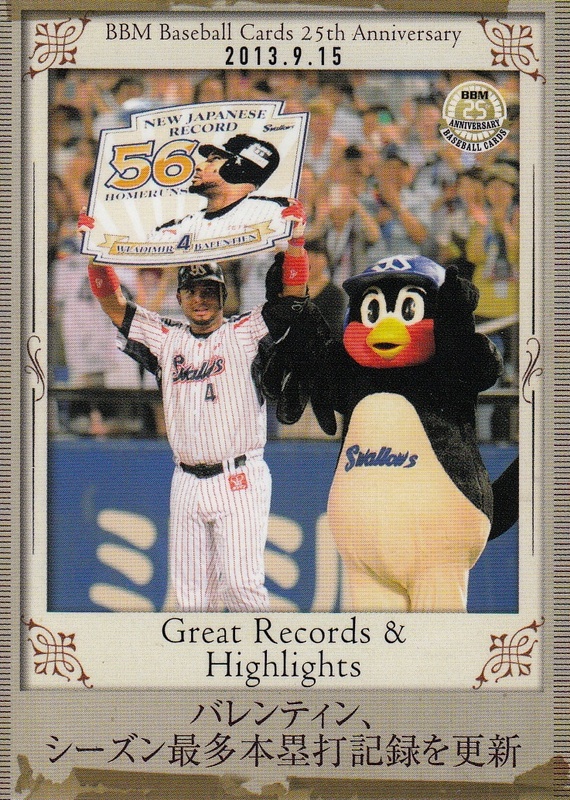 The nine "Great Records & Highlights" cards are apparently a continuation of the subset with the same name from the 2010 20th Anniversary set. 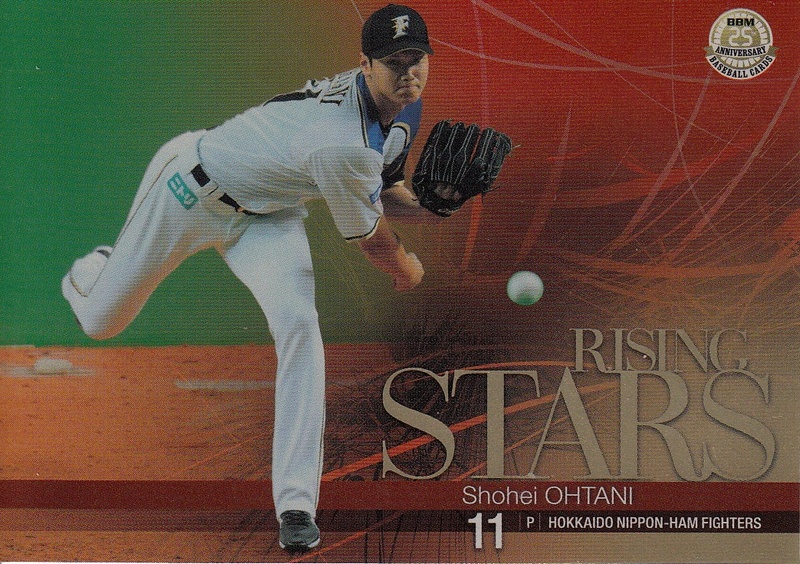 They use the same design and they only commemorate events that have occurred since that set came out. 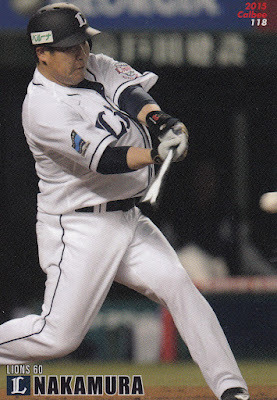 The nine events in the subset are the Marines winning the Nippon Series in 2010 (only third place team to survive the Climax Series and win the Nippon Series), Takeya Nakamura out-homering a team in 2011 (I think), Alex Ramirez 2000th hit in 2013, Hideki Matsui and Shigeo Nagashima getting the People's Honor Award in 2013, Wladimir Balentien hitting his 56th home run to break Sadaharo Oh's record in 2013, Masahiro Tanaka going 24-0 in 2013 (hmm, a lot of 2013 here), Shohei Ohtani having double digits in wins and home runs in 2014, Motonobu Tanishige appearing in his NPB record 3018th game in 2015 and Masahiro Yamamoto becoming the oldest player to record a win in 2015. The set has four six card insert sets associated with it. 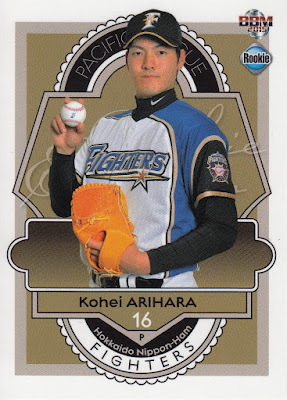 I normally don't get these but I decided to splurge this time. 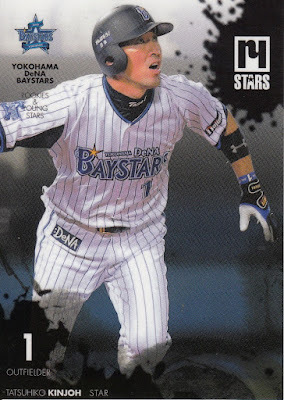 The four sets are "Old Time Stars" (retired players), "Stars Shining Overseas" (Japanese players playing in MLB), "Rising Stars" (young NPB players) and "Legendary Stars" (veteran NPB players - two of whom have retired since the set went to press). 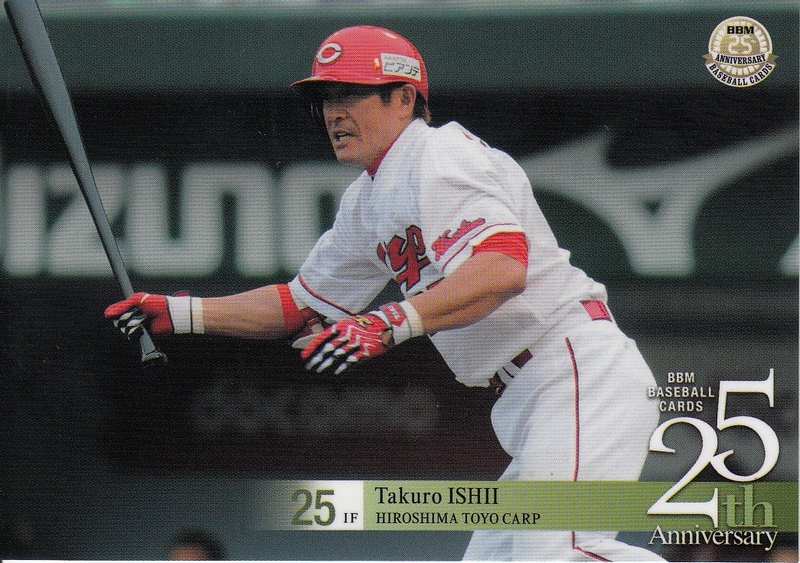 The design of each set is very similar to the others - mostly just a change in the background and banner colors. 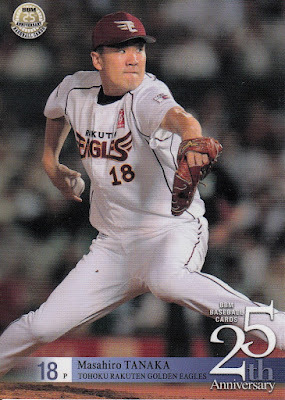 Now that Jambalaya is back on line you can see all the cards here. 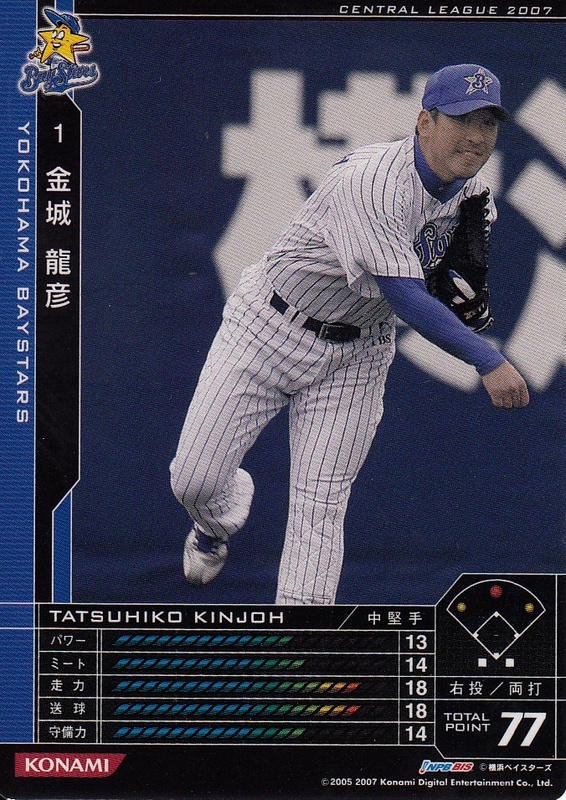 As we continue to wind down the list of players who retired at the end of the 2015 season, we reach Tatsuhiko Kinjoh of the Giants. 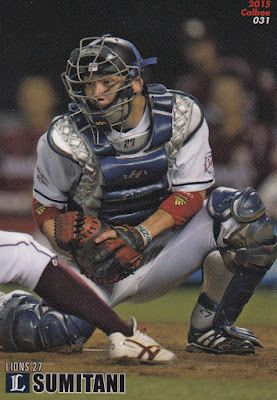 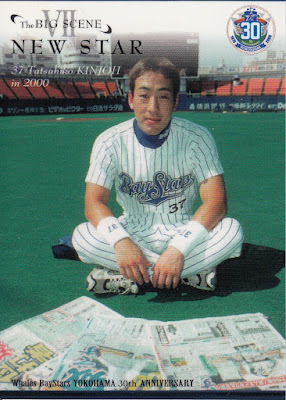 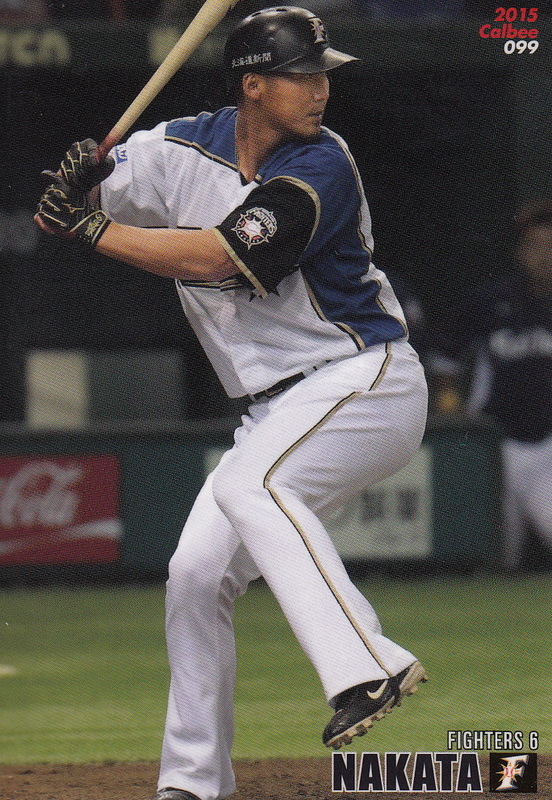 Kinjoh was drafted as a pitcher by the Yokohama Baystars in the fifth round of the 1998 draft from Sumitomo Metals of the industrial leagues. The Baystars immediately converted him to an infielder however. 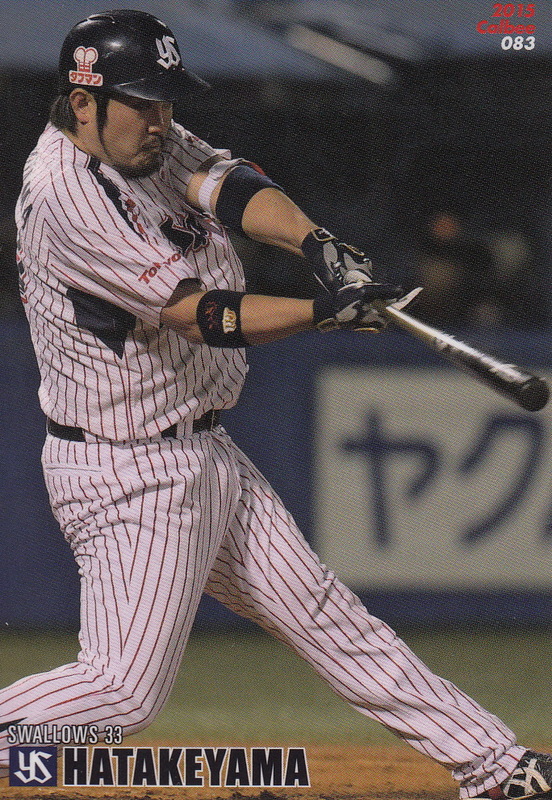 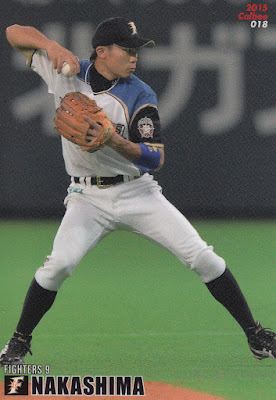 He played in a handful of games with the ichi-gun team in late 1999 but an injury to Tatsuya Shindoh in 2000 pushed him into the starting third baseman role. 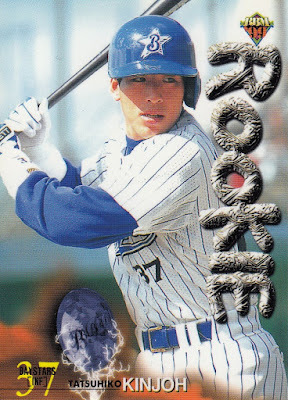 He lead the Central League in batting (becoming the first "true" rookie to ever do so) and was named Rookie Of The Year. 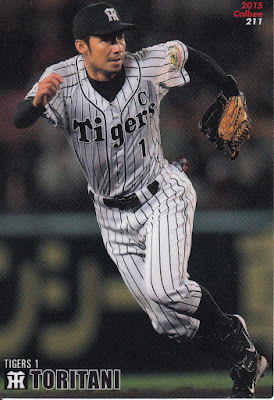 He was moved to the outfield in 2001 due to his defensive shortcomings in the infield (he made 12 errors in 2000) and remained in the outfield the rest of his career. He slumped significantly in the next two seasons, finishing below the Mendoza line with a .170 average in 2002. 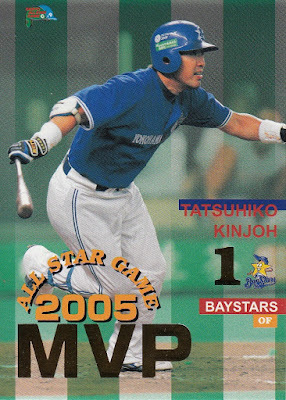 He recovered in 2003, however, hitting over .300 again and making an All Star team for the first time. He made the All Star team again in 2005 (wining a game MVP award) and 2006. He also won Golden Glove awards in 2005 and 2007. 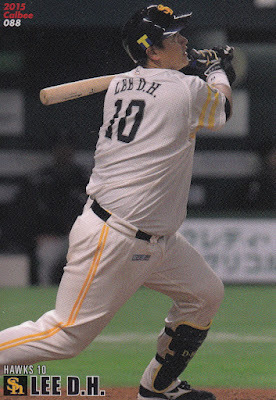 He was a bench player for the Japanese National Team in the 2006 World Baseball Classic. 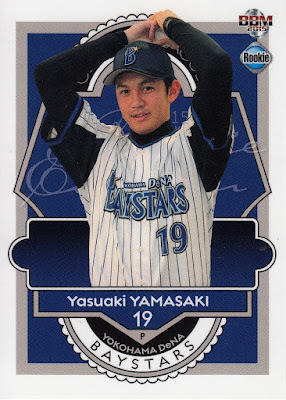 As he was drafted by the Baystars just after they made their last appearance in the Nippon Series, it goes without saying that he never played in one. He left the Baystars for the Giants as a free agent (I think) following the 2014 season. He spent much of the 2015 season with the farm team, only getting into 36 games (and hitting .233) with the top team. 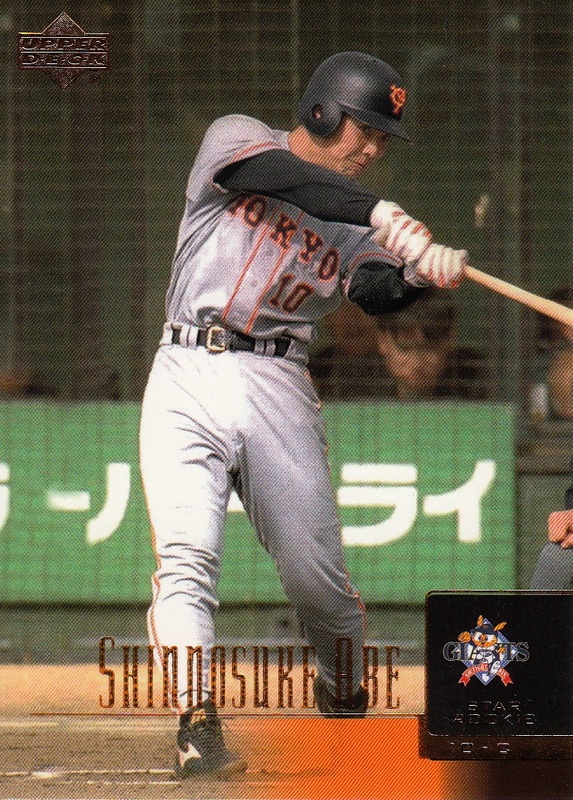 He will be the Giants san-gun hitting coach next year. One interesting thing about Kinjoh is that his father Akiyo pitched in Kintetsu's organization for a couple years in the late 1960's. 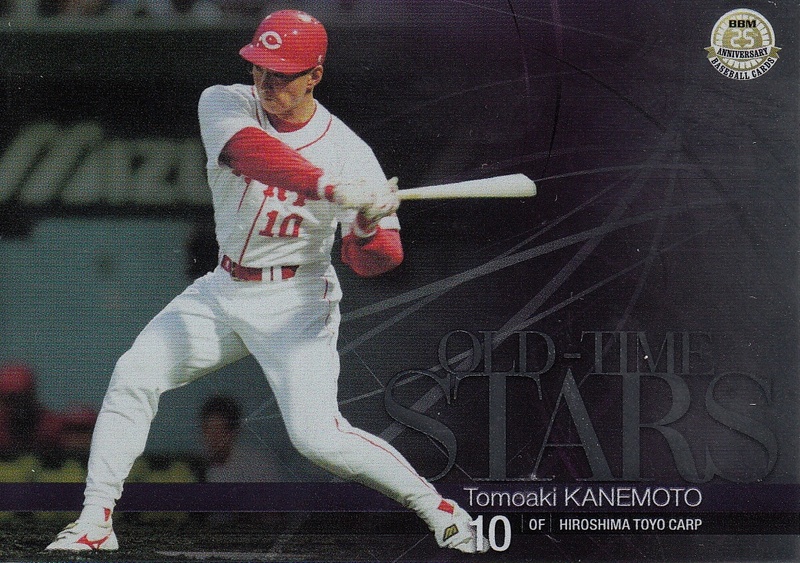 He appeared in one game with the top team in 1968 - but as an outfielder. 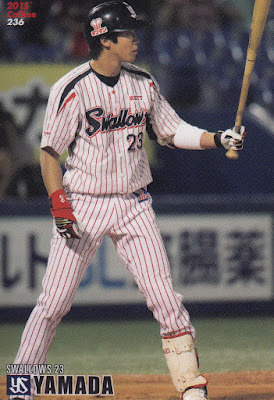 He did not get a plate appearance in the game. It kind of reminds me of Moonlight Graham from "Field Of Dreams". 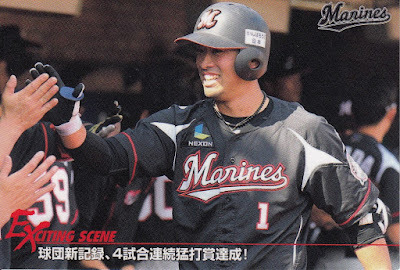 The inaugural Premier 12 wrapped up yesterday with Korea defeating the US in the gold medal game. 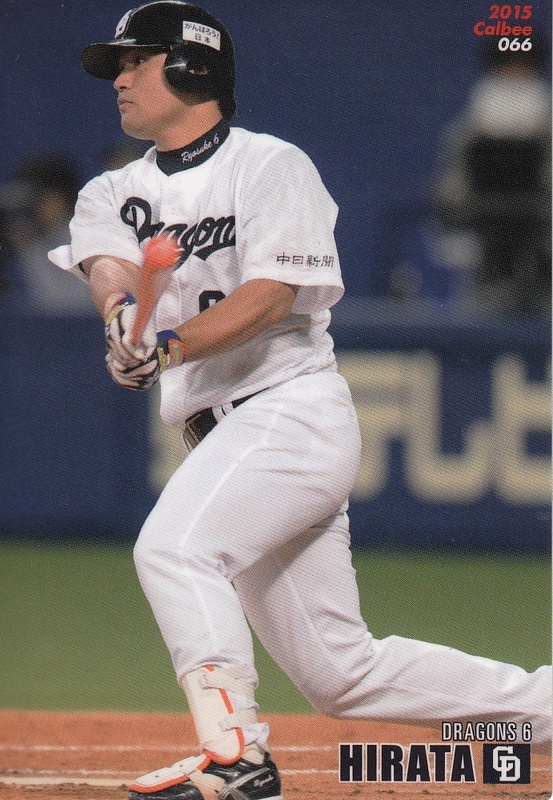 Many would say, however, that the championship game was really last Thursday when Korea rallied from a 3-0 deficit to score four runs in the top of the ninth to upset previously undefeated Japan. 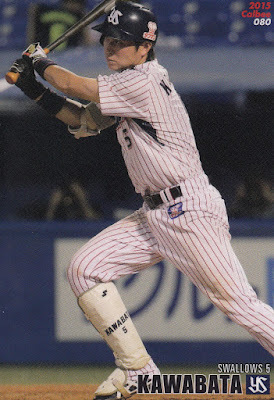 Yesterday's games seem just an afterthought with Japan demolishing Mexico 11-1 in the bronze medal game and Korea downing the US 8-0 in the gold medal game. The tournament awards were announced after the final game and Korean outfielder Hyun-Soo Kim was named MVP. 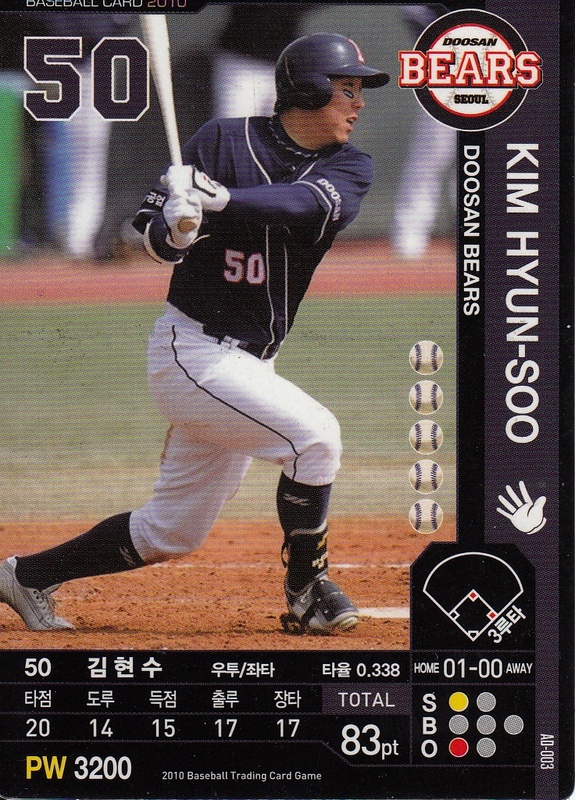 Unsurprisingly, Kim was also named to the tournament's "All World Team" which is the second time he's made such a team in an international tournament - he also made the team for the 2009 WBC.